With Nora Danish and Vivy Yusof, the brains of this collection. Travelling can be a wonderful experience. Especially by plane. One is always excited to fly above the sky, even me! I travel quite often and flights/airports have been part of my life since I was a baby. But what I dread, are flights in the middle of the night or before dawn, especially when you had an event the night before. After sleepless nights due to exam week, on the day of our last paper, we had to pack and go for a fashion show. My parents arrived in KL the same time we got back to the apartment. And you know what? We stayed up looking at wedding photos only to wake up at 4am! Yes. I am quite the zombie. From finals to Sabah to Taylor Swift. A week's worth of excitement! And here we are! At Pulau Gaya (Gaya Island Resort). Doesn't it look amazing? We were given barely half an hour to freshen up and head for Tavajun Bay. And we missed the boat! Luckily they were kind enough to turn back. Malu tak? So we arrived at Tavajun Bay and had lunch there. Thai style. YUMMY! We had tom yam, coconut drink, mango with sticky rice (pulut). And so much, that we had to force it down our stomachs because it would have been a waste if we didn't. But it was delicious! After the food fest, The Husband took some look shots of me before heading into the sea just to buy time to digest our food. And also because I would end up a mess after diving into the sea, dripping wet and all. Read about the look I donned on Paddle Pop : By The Sea. More on our travel soon. This was on the way to Tavajun Bay. The wind was so strong, luckily I wore a turban style so my hijab didn't go flying everywhere. And that would be a style tip for all of you hijabsters. We were in Sabah for our second honeymoon, and between lunch and a jump into the sea, the Husband took these amazing shots of me having fun in the wind. It's amazing how it felt as if we went overseas when really, we just needed our ICs to get here. The look I donned was a fast one. I was wearing the same jumpsuit and hijab when I arrived, since we were given less than half an hour to freshen up. The outer has like a yummy candy-flavoured-ice-cream-colour. Any guesses where it's from? This is my beach colour of the day. Pink. My favourite colour. I think it's best I let it out now. I'm a pink fan. Including, the singer. No joke. Anyways, the whole look will be written at the end, as per usual. Everything is affordable too! As usual. Hehe. Lotsa love! Should I get in? I really want to! Min aka Yasmin Ramli, the designer and founder of When Our Eyes Met is super talented. She's doing my baju Raya, and just for your information her designs are affordable! It depends on what you like, I guess. I'm going for the edgy yet comfortable look for my travel from one state to another during Raya. Opps. I've revealed too much. Enough spoilers! 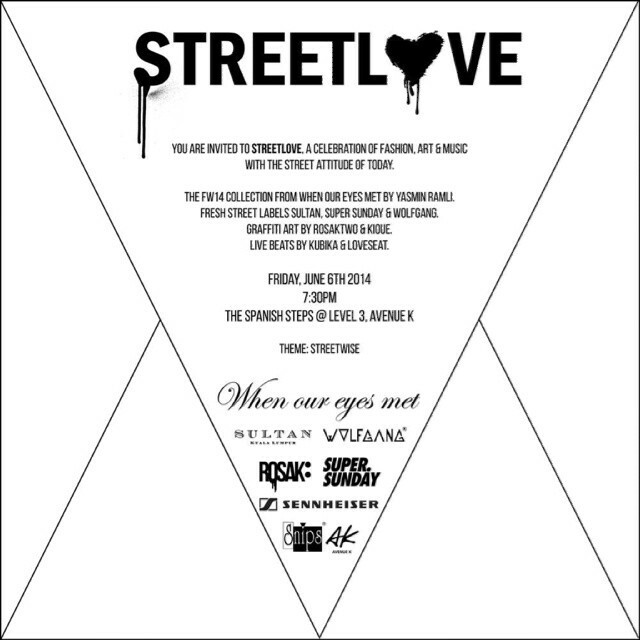 Anyways, it was Min who invited me to this event. We arrived around 8.30pm and took pictures while we mingled among ourselves. The music was loud like a party and the stage was this huge staircase. It was really exciting. And as we came in, we saw Min and stole a shot before she had to go backstage. The last one is my personal favourite! Both the model and the design. I wanted to buy it then and there, no kidding! The whole look screams me. I actually love a lot of the designs by Min. If I had known this, I would have asked her to make my wedding dress. I only discovered When Our Eyes Met after #syadhilwedding as Min is Nadhil's cousin. With Ende Cho. She's always supportive of her children and their work. We left straight after the show as we had an early flight to catch the next day. But, of course, we had our look shots before heading off! Look post coming soon! Wait for it. Till next time. 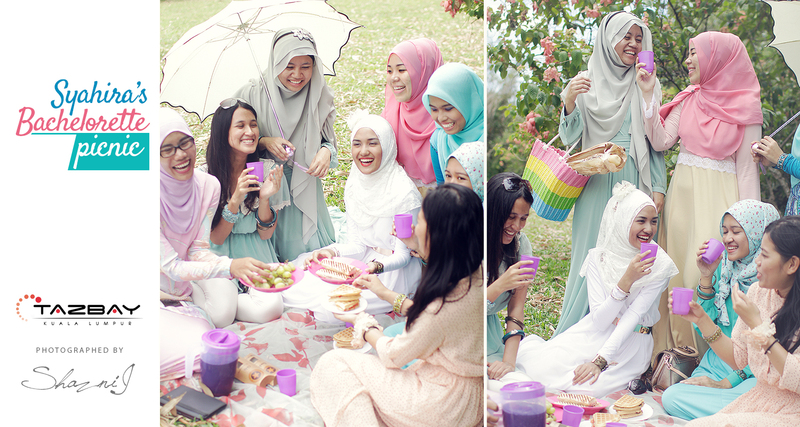 Before #syadhilwedding Part III : The Pretty Pastel Bachelorette Picnic Photoshoot, FATE. Here's a bit of a repost from my old blog but I'll be adding a few details about the girls so I don't have to do it later. You see, all of these girls became my bridesmaids at the wedding. I have to talk about them sooner or later! 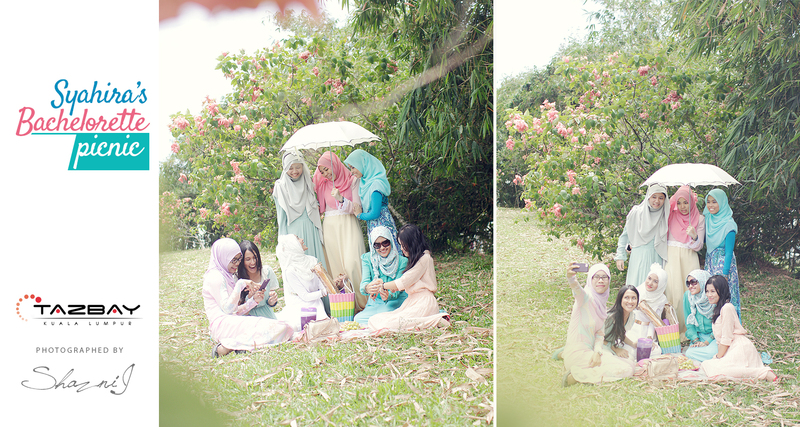 From left: Syuddy, Jasyu, Azra, Adlin, me, Qila, Mai, Zaa. I met them at different stages of my life, under different circumstances and scenarios. The one major thing that they have in common is that they are the rare jewels of my life. Some of them have never even met before I forced them into the shoot together! 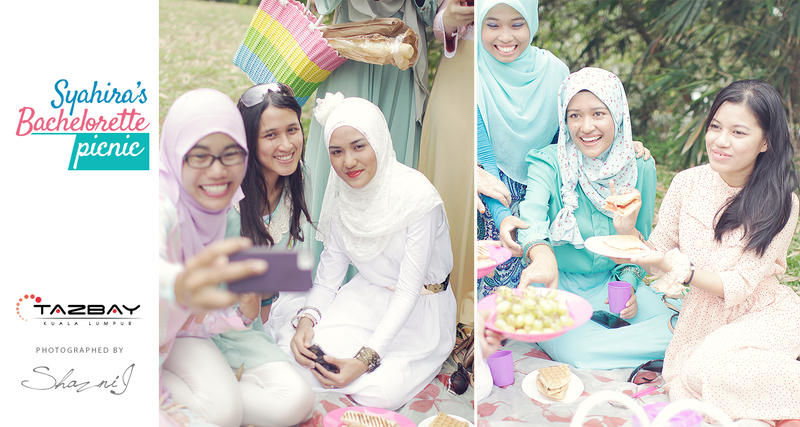 The picnic was AH-MAH-ZING! They clicked in an instant. All of us felt really comfortable with each other. Awesome, right? I thought about writing about each and everyone of them. How I met them. How important they are to me. How much they have done for me. But before that, here's one thing they all do for me: They are always supporting me. They always have my back. No matter what. Even if I'm wrong. They still stand by me. With me. If the world turns its back on you, these girls will turn their backs to the world for you. That's how much they are incredibly wonderful. Alhamdulillah. I have friends that are like family. Granted, Syuddy is my actual sister. Actually, all of us had individual look shots, but if I posted those up here, these girls would kill me! Maybe not all of them? Hehe. It's so tempting to post their photos and talk about them, individually. But that would take a year for me to write! So here's a snippet of what's in my heart. This is Jasyu & Mai. The Ipoh girls. Funny enough, I met Mai when I was in Form 2. She was my classmate in SMK Raja Perempuan Ipoh (aka RPS). I met Jasyu in Form 5. She was my classmate in Ipoh International School. Mai and Jasyu met because of me. Then, they became best friends. How did that happen? I have absolutely no idea! Suddenly, after our school days, we were really close and the three of us always plan hangouts together. And now, we're practically sisters! It's crazy, isn't it? Fate. This is Zaa. Now this looks interesting, doesn't it? Hihi. Zaa and I met during my second semester in IIU, which is the semester before we had this photoshoot. She is part of my #Foodie gang. As in, we go the miles to eat good food. Although, since I got married I haven't been doing that. I used to eat so much and such good food that eating became an adventure for us. They used to say I'm a fat girl inside. Which, I am! Haha. Zaa is my senior, by the way. "These three beautiful girls stood in front of me. The girls that have been there for me this whole semester. The days I was in tears. The days I had to face my fears. Choosing outfits. All our laughters. We slept together, studied together and took a step to adulthood together. Each one of them teaching me their own kind of lesson, each one always motivating to move forward, to shoot a few times. And to learn that you don't have to score all the time, you just have to try hard enough, with each other, having each other's backs. You're not supposed to judge. You're supposed to keep their secrets like keeping your own. You're not supposed to be correct all the time. You are human. You make mistakes. But you grow up from these mistakes. You learn. And the most important thing of all, I learnt that some people come and go, and others, they stick. By the way, these girls are my juniors. So the big question: Why did I separate them into groups in this post? Because these 'groups' have never met each other before this photoshoot. I grouped them together for this memorable day, only to know now that this is a day of great history. Everyone became good friends here. On this day. And that is one moment that I can never forget. Fate. Here's the last one to write about. My sister, Syuddy, in my skirt and shawl. Hehe. She is my twin, by heart and mind. She can read my mind. Even when we're far apart. She was my maid of honour at every #syadhilwedding event. If I write about her, it will take a lifetime. Because that's how long I've known her. I remember, when we were little, I always wanted to dress like her. Then, as we grew older, we enjoyed dressing alike to confuse people. In New York, especially, everyone thought we were twins. She is not my twin. She is older than me by a year, just so you know. Anyway, this ends my very long post! Took me a few weeks too! These girls are very important to me as each of them had played very different roles in shaping me into the woman that I am today. Praise the Almighty for blessing me with precious gifts like them.